Hey, I'm Sophie. I'm a third year college student graduating a year early, in May 2016. Follow me (I'm a Leadership minor) @hopesophie17 on Twitter and Instagram, send me an email at sophie.guetzko@hope.edu-- I'd love to chat (I'm a Communication major). While on campus, I've been involved with numerous Bible Studies, The Anchor newspaper, CFL Consulting, and recently started my own t-shirt company through the CFL Incubator program. Hope to talk soon! The letter came in early March to my mailbox in the mailroom: the letterhead of a college that is different from Hope. It’s red and white (thank goodness, not maroon and gold… sorry to all of you Calvin fans) and it’s 229.5 miles from my cozy apartment east of campus. And what it had inside of it was a yes. I remember what it was like to stand on campus as a freshman three years ago, feeling as if there was a lifetime ahead of me. Little did I know, the lifetime ahead of me would be true. But my time at Hope would be over in the blink of an eye. There is no greater place I could have spent my undergraduate degree – no place I would rather have eaten Caprese sandwiches and drank coffee and traded my home in the cornfields in Iowa for a home near the beach for three years. The diploma will say Communication and Organizational Leadership in a few short weeks, but graduation is a finale that holds much more than a degree. It’s has been journey toward myself, but greater, a journey toward God. I wouldn’t have found myself without Him. I have a group of over 20 friends, all of whom I will keep in contact with for years to come (and forever, if it was up to me.) And I have a home here and a home back home and a home at the friend’s houses I visited during my time here. And I will add another home to that list oh-so-soon. It’s an 11-month program, and in July 2017, I will conclude my Master’s Degree in a Master’s of Science in Information and Communication Sciences. The best part? I learned about this program directly through the campus of Hope when the director of the program came to visit in the Business department. In addition, due to the preparation and work experience my time at Hope has provided me, a graduate assistantship is also a part of my graduate study experience: an opportunity that helps cover the significant cost of graduate school by working 20 hours per week. There are great things ahead, of that I am sure. And although these last three weeks are bittersweet, I can feel God beginning to blow the wind around me in a different direction. I am grateful for Hope, both uppercase and lowercase, for the preparation for the graduate opportunity I’ve been presented with for the upcoming year. Thinking graduate school may be an experience you’d like to look into? Check out the CICS page for Ball State to learn more about my academic program, or contact me at sophie.guetzko@hope.edu for more information. I’m a food connoisseur – not just because I’m a college student – but also because I’m a, well, hungry college student. I lived my first two years in the downtown strip of Holland, running triathalons between JP’s, Jimmy John’s and Lemonjello’s- but this third year, I discovered there’s so much more to explore. Yeah, I’ll take a gluten free chocolate chip coconut muffin, a vegan berry cookie, an almond milk chai and a strawberry mint smoothie. Everything here is gluten-free, basically. And just say, “hold the egg,” if applicable. Like Thai, rice noodles are a gf’s bff. There’s even less egg here. You might call it Qdoba or Chipotle… but this is delicious x10. Super fresh, super yummy. And you get a free fountain drink when you show your ID. 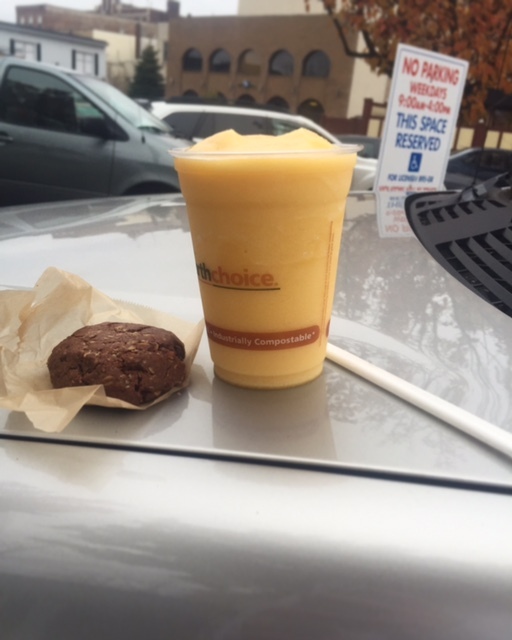 The options are great, the fresh-squeezed orange juice is even better. I hear the milkshakes are good, too. And the pancakes. And scrambles. You can’t really go wrong here. The next time someone asks you out to dinner (especially toward my allergy-related friends), take a deep breath (without being afraid of your allergy). There’s plenty of food to go around. Where has the time gone? I’m three weeks into my final semester at Hope. They say if you blink you might miss it, so I’m doing my best to keep my eyes wide open to capture every moment I can. Four years goes fast. And if you complete college in three years (like myself), it goes even faster. I remember getting that letter in the mail in the summer after my senior year of high school, reading “you’ve transferred 37 credits.” I remember dodging re-signing up for Gen Ed classes I’ve already taken plus a couple major courses as well. I remember the long conversations with my parents, wondering if I should stay the full four or just graduate in three. Looking back, I’m not sure when it happened, but I decided three would be enough for me. I introduced myself saying I was a freshman, to a sophomore graduating in three years (to which people replied “obviously” because senior year is three years away from sophomore year) to a junior graduating in May. And now the final spring semester is here. It will be enough for me. At the same time, three will never be enough. Four will never be enough, either; and I remember that. I’m not afraid to graduate in May, which sometimes scares me. What will I do? Where will I go? I’m waiting to hear back on internships and jobs and the – yikes – one grad school letter to see if maybe I made the cut. And I found out that graduating high school is just a first round practice to graduating college. It’s a practice run to be able to do it again. It’s beautiful. I’m in a creative writing class writing poetry every day and a photography class taking pictures. I’m in my final Communication course buttering bread and playing Jenga in class to learn about the way organizations function. I’m in a leadership class reading about Ernest Shackleton and his incredible journey to Antarctica. There are so many adventures yet to be had, places to go, steps to take. And I’m grateful God is always one step ahead of me. It’s true, I’ve been sleeping less often than usual. I’ve been snacking during weird hours and eating sugar cookie-flavored popcorn at 10 a.m. But this finals week is not about me. It’s not about the stress, anxiety and realization I don’t understand a single concept on my study guide. It’s not about the lack of sleep. It’s about the plans that are unfolding for me. When people ask me, “How’s your week?” I reply, “I’m busy, but I’m still.” Maybe, too still. But then I remind myself this is the way it’s supposed to be. We’re supposed to feel at peace. We’re supposed to be sober-minded and not become hung up on the small things of the world. And I know I have a lot to do, but it will be accomplished. Five semesters in, and completion hasn’t failed me yet. I watched a Vimeo video last week that reminded me of something important: our degrees are not about us. They’re about the way we’ll help other people once we leave. The things we learn here are only a glimpse of the things we’ll find in the years to come. And we see some of our friends applying their knowledge already, such as my friend Danny, who is a part of the nursing program. He’s the first person we call with random symptoms and questions about whether or not we need to go to the doctor. Our typical diagnosis: exhaustion. And our prescription is sleep. And sometimes we fail, in the way I’m taking an interpersonal communication class studying nonverbal cues, but for the life of me I can’t maintain eye contact with the cute boy who sits next to me. I think that sometimes we forget that the things we’re taught – the really difficult things we’re taught, either in content or in emotional investment – are the things we feel are a burden. That’s because they are, and they will be. And our learning of it now is what allows for us to manage it later when we experience it in our career in a very short amount of time. I’m sitting in Martha Miller with papers strewn about my computer, a half-eaten bag of popcorn, a water bottle and five open notebooks, and I laugh. This is only the beginning of the greatest adventure of my life. I will be still. I will rest in the peace that has been so freely given to me. And I will learn. I will learn, not for myself, but for all of the people who will be waiting for me. There’s a park at the end of the east side of campus in the square that makes up 10th, 12th, Central and River. Its name is Centennial Park. I know that now. But freshman year, while trying to find the Pine Grove (and inadvertently walking directly through it to instead find Centennial), I sat down at a bench and stared at the empty park, wondering “where the students might be.” But I fell in love with the park’s beauty. The fastest way to get there is to walk through the Vander Plaza and across Central Ave., but if you walk to the east, you can’t miss it. And if you walk through the Vander Plaza, you’ll see it: the statue of Albertus C. Van Raalte, founder of Holland, Michigan, an individual who played an integral role in the founding of Hope College. It’s taken me two full years to see it. It wasn’t until late one night, while standing under the streetlights behind the statue, that it became clear to me. The statue of Albertus Van Raalte, which stands in Centennial Park. Where the statue of Van Raalte stands, there lies a pathway that gives a deep view back into campus. 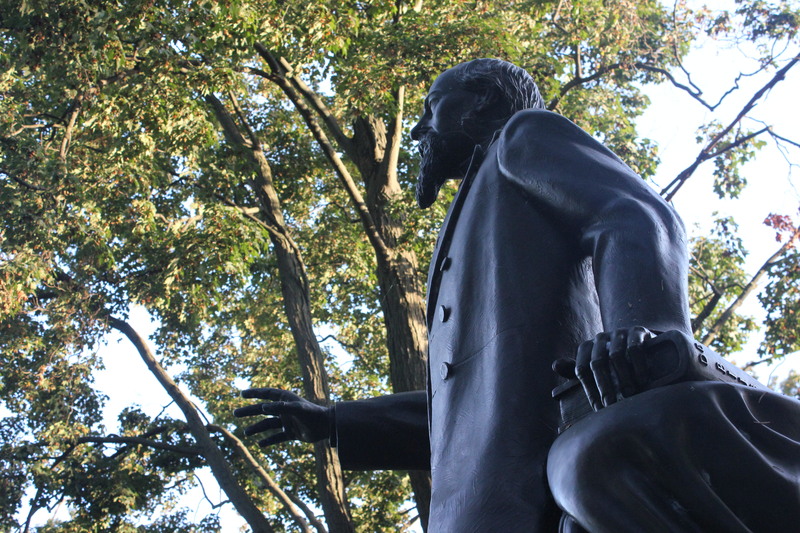 With his right arm outstretched and his left hand resting on a book, his statue in the park looks back to campus he created. And when I saw it, I began to ponder: as Hope celebrates its 150th anniversary this year, we have stumbled into a 150-year vision. His vision was not short-term when he created it. His vision was for now, 150 years later. His vision is for 150 years to come. Great wonder surrounded me as I began to consider that when this college was founded, Van Raalte founded it with us in mind– for many of us, over one hundred years before our birth. I think of the hope he dedicated to this place (no pun intended) and the great faith he pursued to create the space we now know as Hope. I think about the way I have become entangled in that vision. And my hope is that, if Van Raalte were here today, that he would look at campus and consider us to be the colony he envisioned. My hope is that he would not only look at campus, but also the community of Holland, and be pleased – that he would feel his hope is being fulfilled. I want to remain entangled in that vision. I will seek first the Kingdom of God. I will seek its advancement. And I am both grateful and blessed by the prayers of many who have come before me, who do not know me and likely never will, for their prayers have come to life within the faith community of Hope. As I wrap up this semester and enter into my final semester of Hope, I realized something important: when I leave, others will take my place. They will take my place next year, and the year after, and in 150 years to come. And I pray for them although I do not know them, because I know there are many who have done the same for me. My heart wishes to advance the vision Van Raalte had at first, in hope that the Lord will raise up others to continue to work of the kingdom. LLC (The three-page document making your company legal)? Check. Fifteen boxes in the back of my SUV? Double check. Whose debit card did we use again, anyway? Just kidding. But we’re a discombobulated mess… sometimes. The three of us live only three blocks apart, but now we know why people who work for businesses work in one location together for a reason. Regardless, things are going well. Can you think of the first time you found someone you liked who really liked you back? You begin to spend so much time with them that you begin to stop spending time in other areas. If you start a small business in college, it’s almost a requirement to “date” your business. You have to spend time with it, take care of it, and spend money… but it’s all for a really great benefit. Keep a planner. If you can specify certain hours for homework vs. business work, your time will be spent effectively. Don’t multitask. Complete one task at a time, and work on it until it is finished. Being able to check tasks off of your list is rewarding. Create an elevator pitch. People will want to know about your business, but they don’t want a two-second answer or a thirty-minute conversation. Create a concise and repeatable way to explain your purpose. Delegate tasks. You have a team for a reason. Separate out roles to ensure that everything is done, but you don’t have to do everything. Separate your personal and business accounts. Running grocery money and business money off of the same card can be confusing. Sleep. You won’t want to. You may feel like you can’t. Do it anyway. You’ll feel better in the long run. The first place I saw it was in a post on Facebook: “The attacks are close to me. But I’m okay.” The person, a friend from high school, was marked “safe” in the attacks, the post said. And I began to scroll through my Facebook feed I began to see more news articles appear and a post from another friend living in Paris, “Jesus, make yourself know here.” And even this afternoon, I see over fifty Facebook friends changing their profile picture to the red, white and blue in “support,” as Facebook says, of Paris at this time. Facebook is calling it a “temporary” profile picture change. But changing our profile picture is not enough. Among the hundreds of news articles, blog posts and stories we see, there is a small mention of the other events happening in the world at the same time. The hashtags we choose to add onto our social media posts are not enough. Because tagging #PrayforParis doesn’t actually create a prayer. Changing our profile picture doesn’t rebuild community. It doesn’t replace the broken hearts and the lost lives. I don’t mean to be critical, but I want this to be real: we have to start praying, and praying for a long time. For our brothers and sisters overseas who are being persecuted and killed every day, not just in Paris but across the world – we cannot be immune. 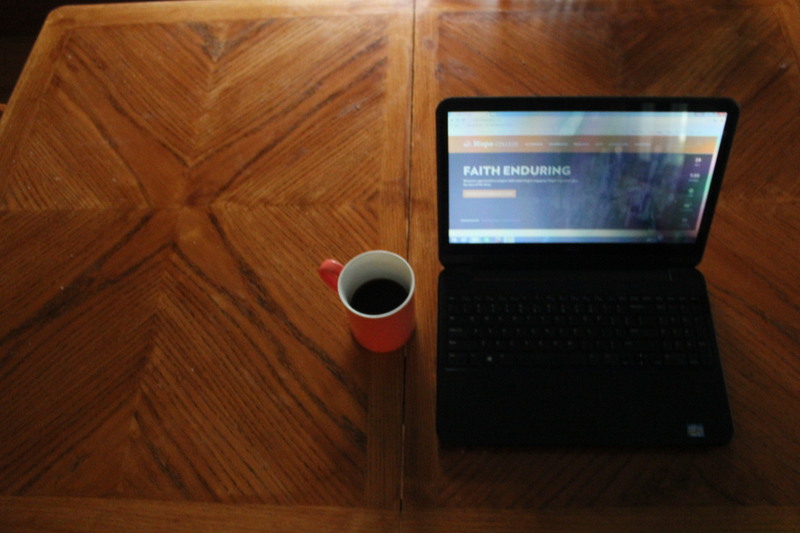 For the lost, the broken, those who have never heard of Jesus – we cannot hesitate. What we see every day when we turn on the news, both local and world, is how much we truly desire peace. And our peace cannot be a worldly peace, because we see too many hearts breaking a little more every day. But we also see the breakthrough of a powerful God that comes into our situations and brings peace and restoration. We see hope rise and darkness flee. We see our prayers move in power, in the same way of the Kingdom of Light. 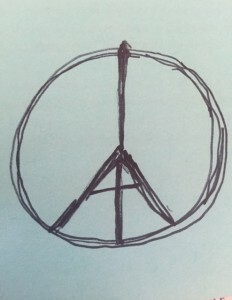 And I like the way the Eiffel Tower was placed into the peace symbol. But I can’t help but notice the cross it creates at the bottom. We have to bring the hope and light of the Gospel into France– not by our Facebook profile pictures or the things we hashtag, but instead by an incredible God who loves us– and loves them– more than any of us can fathom. We have to choose to pray, and pray hard. 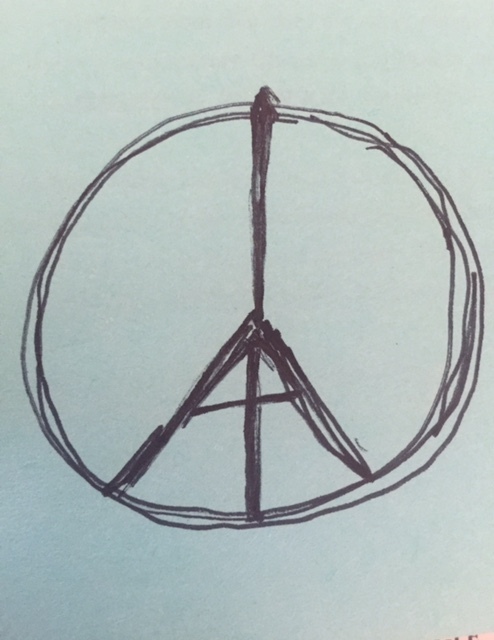 Not only for Paris, but for the world. Not just today, but every day. #PrayforParis isn’t just for the next 24 hours on our Twitter and Instagram news feeds. Our Facebook profile pictures can’t be changed “temporarily” to support those who need hope. It’s a lifetime prayer. We can’t allow our praying to be a trend on social media– we must allow it to be a trend for our life. We found two sunny, 70° weather days in the beginning of November, but it’s back to 50 with clouds today. Among the (non-snow) flurry of changing leaves, fall boots and flannels, I think that we sometimes forget one important thing: not only are the seasons changing, but we are as well. As we found out with November’s glimpse of summer, what we recieve is not always what we expect. I opened up a journal from my freshman year today and I read a prayer that was complex in words and nature and I realized that sometimes the boldest prayers are the simplest. My current prayer: God, provide for me. There’s nothing wrong with specific prayers; no, that is not what I am trying to say. 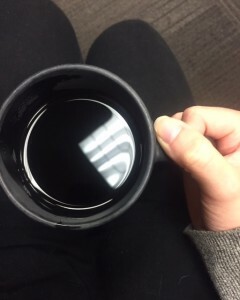 But as the sleepiness of November kicks in, I often cannot fathom what even might be my need. Therefore, I trust the Lord to provide for me. I never would have guessed that I could ever find myself here, a senior, typing in a fluffy white chair in the living room of Fairbanks Townhouses when I was a freshman living in Kollen Hall. It’s true, I think. Nothing feels like it’s changing, but one day we wake up and nothing is the same. We have to have the courage to believe that things can be different, that nothing has to stay the same. That courage takes root and grows a tree, that then will become both a place to climb for play and a place of shade for rest. I realized that the loss of one thing will one day lead to the growth of another. We hear it said many times, but we have to believe it’s true. The winter we sometimes find ourselves in will soon become the spring. I finalized my final class registration schedule on Wednesday and as I sat with my advisor, I saw only six credits that had not yet met the requirements. Two classes, which left ten flexible credits of which I can do as I choose. I began to think about all that is to come. I went to Lemonjello’s this morning and got a chocolate cherry cookie and a peach smoothie to pass the time. I sat in Dimnent forty minutes before Chapel began so that I could sit and just be still. As some of us lose our strength in this season, in the way the trees lose their leaves, we must not forget the importance of what it means to still be growing up. 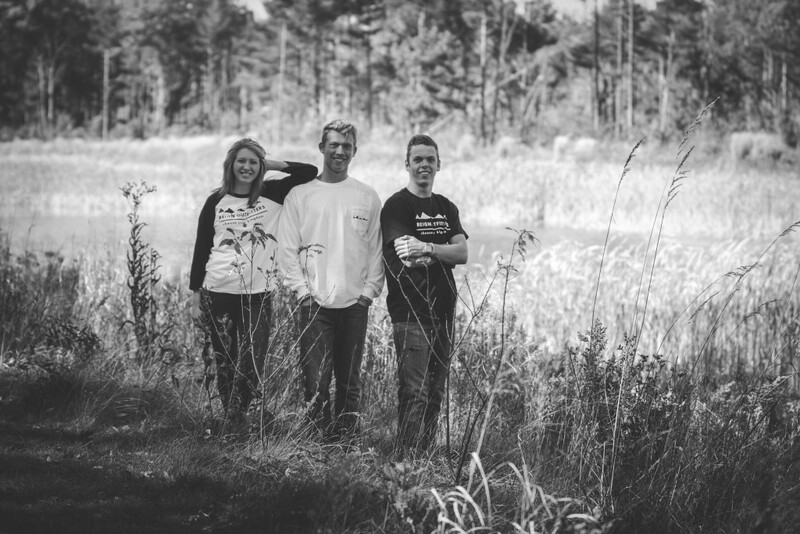 College-age is old, but we’ll keep getting older. And what a joy it is to continue to learn. There’s a kingdom that reigns in each one of us. A kingdom that was built to be explored. I’ve been praying a lot lately. Praying that my career and life and all that is ahead would somehow fall into place before my eyes. But I know life doesn’t work that way. So I celebrate the little victories and mourn in the little disappointments. I think that’s the one thing we miss sometimes. It’s hard to rejoice when we know others are in pain, and it can be difficult to be sad and not feel like a burden. And one day in early August, I was sitting at a table outside of a restaurant in Scotland with my mom and I pitched to her an idea that has now changed my life forever. 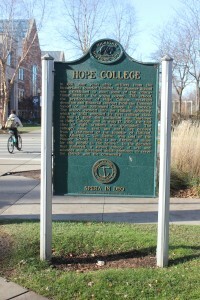 I’ve been involved with the Hope College Center for Faithful Leadership Incubator since last January. It’s a program that sponsors students to develop ideas and support them as they begin their entrepreneurial journey. I worked with social media app development January through August; however, one of the most important tasks of an entrepreneur is to pivot. So, I created a company. A company that is not so much a business as it is a company that provides a companionship for you reign your kingdom. 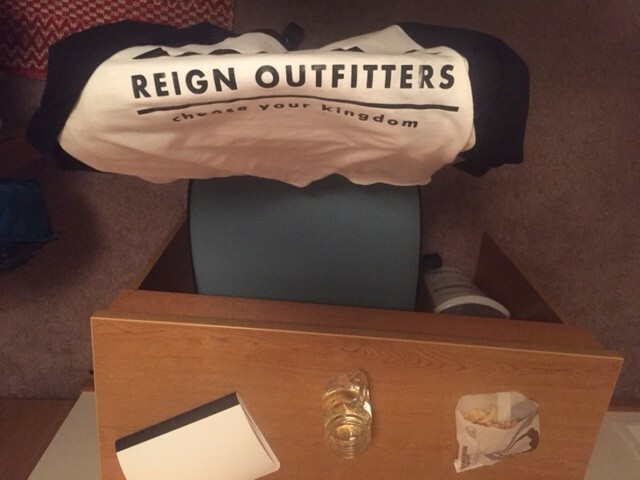 It’s called Reign Outfitters. It’s a clothing line designed for you and your journey. We know the importance in being prepared. But we go farther than your backpack and boots. It’s a clothing line designed for the health of your heart, mind, body and spirit. I’ve spent the last month and a half preparing for our launch (sorry I haven’t been around!) but now that it’s here, I’m filled with great joy. Take heart, my friends. You can start a business in college. 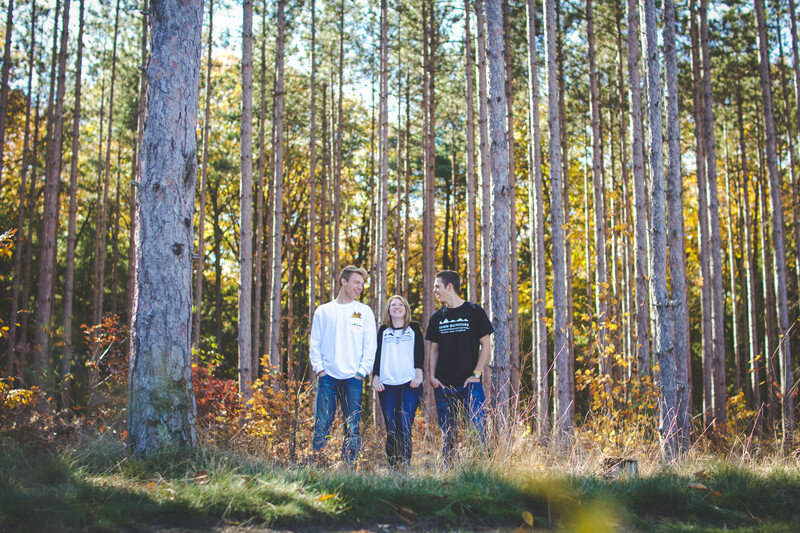 You can find great support, mentorship and assistance in doing so during your time at Hope. We’re growing in community with one another every day, and what great joy it is build a company with a focus on real community. We’re a company with a focus on potential, one that strives to grow good seeds to build a community of real life with a faith influence. I want to be okay with not being in control and watch in awe as I read the novel of my life. And most of all, I want you to come with me. Whether you check out our website or take a rain check, my message is the same: darkness and light can’t dwell in the same place. You can decide what holds the truth in your life. Choose your kingdom.